ClubCoins Needed: 72 Please note that this item is not available on your device. You may add the item to your Wish list and redeem from a compatible device. With its first broadcast on BBC Radio 4 on March 8, 1981, this dramatised tale of Middle Earth became an instant global classic. It boasts a truly outstanding cast including Ian Holm (as Frodo), Sir Michael Hordern (as Gandalf), Robert Stephens (as Aragorn), Bill Nighy (as Sam Gamgee) and John Le Mesurier (as Bilbo). Brian Sibley's famous adaptation has been divided into three corresponding part… s, with newly-recorded beginning and end narration by Ian Holm, who now stars as Bilbo in the feature films based on The Lord of the Rings. Part One, The Fellowship of the Ring, introduces us to Frodo Baggins. With his uncle Bilbo having mysteriously disappeared, Frodo finds himself in possession of a simple gold ring that has great and evil power. It is the Ruling Ring, taken long ago from the Dark Lord, Sauron, who now seeks to possess it again. 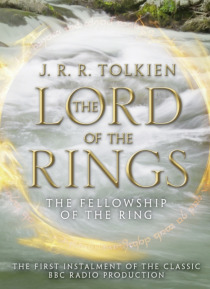 Frodo must do everything he can to prevent this, and with the help of Gandalf the wizard and a band of loyal companions he begins a perilous journey across Middle-earth. Sauron's Black Riders are on their trail as they travel to Rivendell, attempt to cross the snow-swept Misty Mountains and, in desperation, enter the terrifying Mines of Moria.